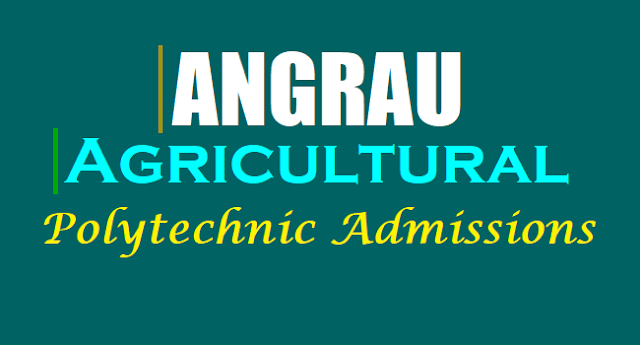 Acharya NG Ranga Agricultural University Admissions 2019, #ANGRAU Polytechnic Admissions 2019, Acharya N.G. Ranga Agricultural University Polytechnic Admission Notification 2019, Agricultural 2 year Polytechnic Diploma Courses and 3 year Diploma in Agricultural Engineering Course. ANGRAU Polytechnic Admissions 2019: The Acharya N.G. Ranga Agricultural University will issue the Agricultural Polytechnic Admission Notification 2019 in this May month, 2019 and the AGRAU will invite the online applications from the eligible candidates for admission into two year duration Agricultural, Seed Technology Polytechnic Diploma Courses and Three year Diploma in agriculture Engineering courses in Acharya N G Ranga University and its affiliated recognized private Agriculture Polytechnic institutes for the academic year 2019-2020. The students who have passed SSC or equivalent exam and those who are residing in rural areas are eligible. The student must have studied at least 4 years during the period of first to tenth class schools located in rural areas. The candidates should obtain 55 percent marks (excluding Hindi) or 5.0 Grade Point Average. In case SCs and STs categories the candidates should obtain at least 45 percent of marks or 4.0, 5.0 Grade Point Average. Medium of instructions for all the Polytechnic course is Telugu. The candidates for admission to first year polytechnic courses in the University shall be required to have completed 15 years of age as on 31st August, 2019 of the year of admission with an upper age limit of 22 years. Interested candidates may for admission on prescribed format along with a Demand Draft of Rs. 400/- only for General Candidates and Rs.250/- in case of SC. ST and PH Candidates drawn on a nationalized bank in favour of Comptroller, ANGRAU, Rajendranagar, Hyderabad - 500 030. Candidates can download application form from official website. All columns in the application form should be correctly filled and the filled in application form should be sent to the following address along with the required documents. Sir when will 2nd phase counselling for agricultural polytechnic. I got 9.7gpa in ssc ,academic year 2017. I applied for agriculture Polytechnic. Please tell me the dates of counseling.